Pokhara—Prime Minister KP Sharma Oli said that the peace is the pre-condition for the prosperity of the nation. Extending theNew Year 2076 BS’s greetings to his people in a special address today, PM Oli said that the group that had been urging for separate nation, national anthem and national flag for years has now come under mainstream politics is a great achievement. He also expressed his happiness that there is no movement of separatism in the nation now. Saying that the nation is now moving on the way to stability, PM Oli warned that the vicious circle is not acceptable at any cost in Nepal now. “But the rights of peaceful protest and demonstrations has been guaranteed by our constitution,” PM Oli added. PM Oli further claimed that numbers of nations have taken Nepal’s peace process and inclusive democratic system an exemplary task. They also take Nepal a rising economy- PM said, but federalism is very new practice for us. 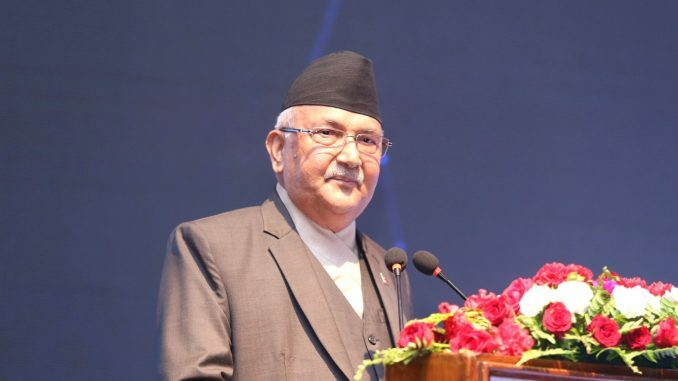 “We are learning by doing,” PM Oli explained. PM Oli further said that the corrupt person could not be a Nepali and added that corruption is the enemy of good governance. According to PM, the main future course of Nepal is peace, unity and development.